We follow up a tip (thanks Henry!) 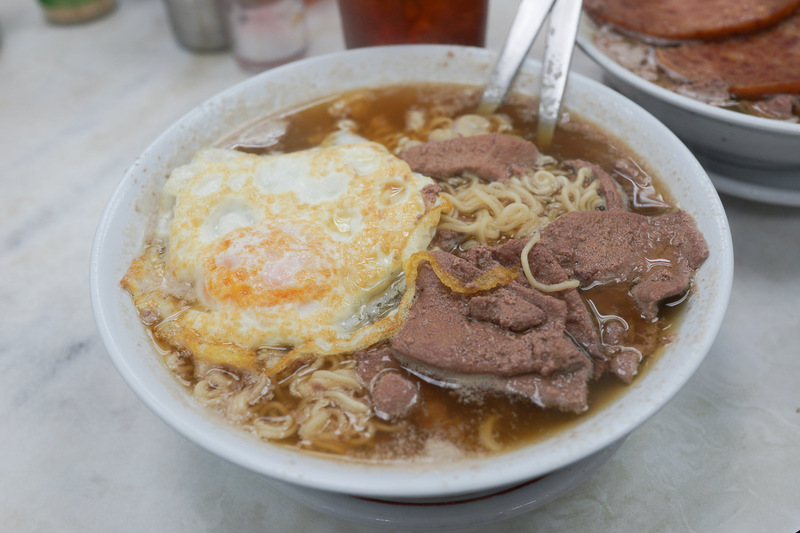 on Wai Kee pork liver noodles in Sham Shui Po, Hong Kong. 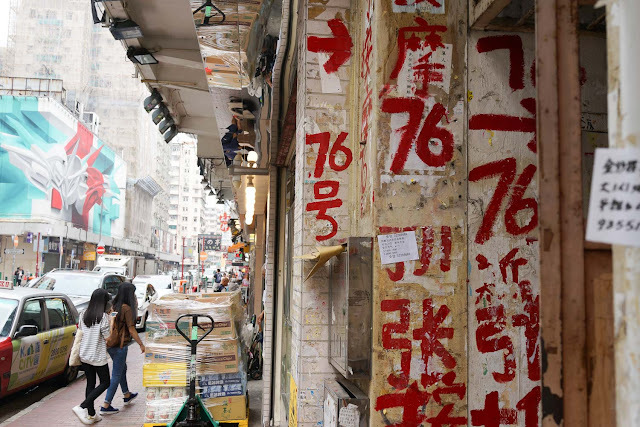 We always love coming back to Hong Kong, there is simply no place like it on Earth, and Earth has a lot of places. 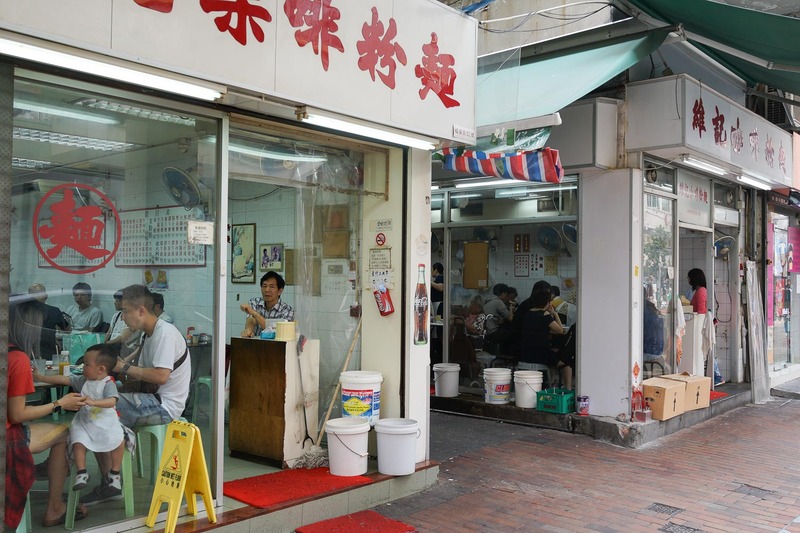 We walk to Sham Shui Po, a hearty stroll from Kowloon. 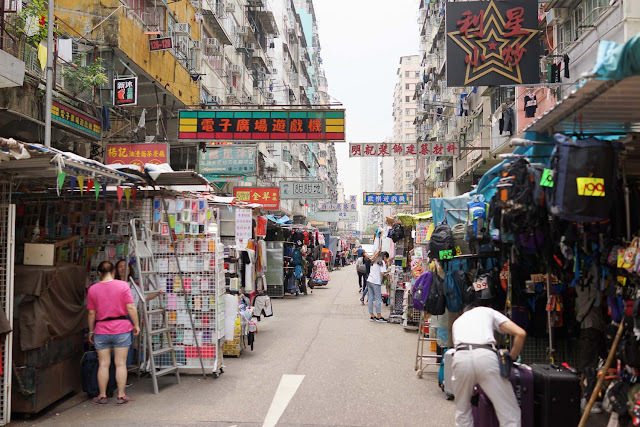 Sham Shui Po has a great market with lots of second hand junk, and we mean junk, but also the usual stuff - clothes, fabrics, phone covers etc. 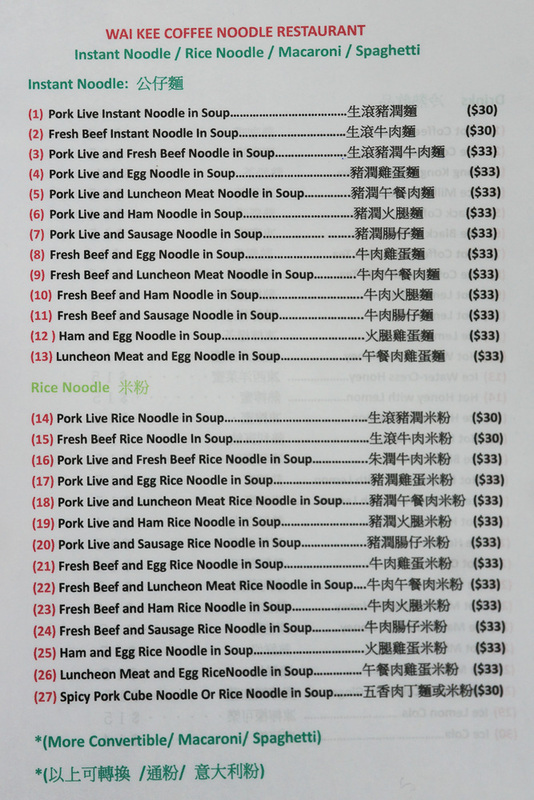 We reach Wai Kee Noodle Cafe for brunch. They must be doing well because they have expanded into the shop next door, we pick a shop at random. This place has a jovial vibe on a Saturday morning. On this trip we developed an extra level of love for the folks who work in these little Hong Kong restos, especially the aunties, we met some really kind and jolly souls. Pork liver and egg in soup with instant noodles. It's a heartwarming broth, it's meaty but not liver-y, while the liver is very liver-y. 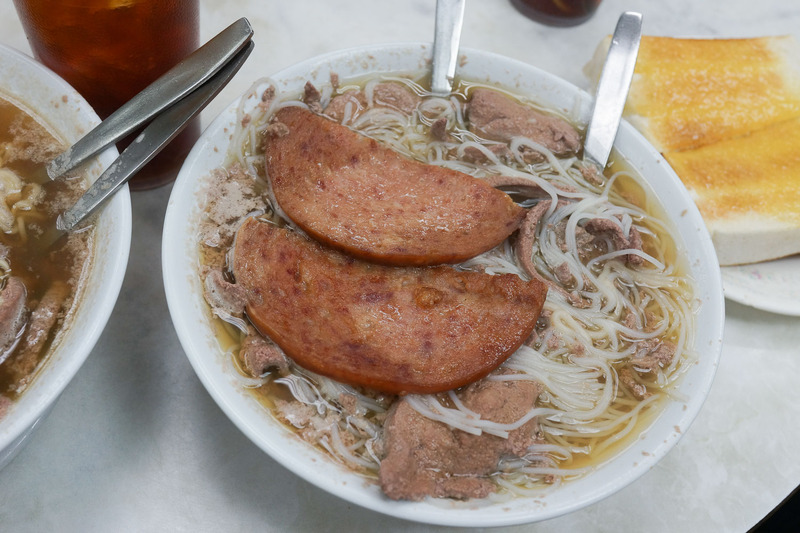 Pork liver with luncheon meat in soup with rice noodles. 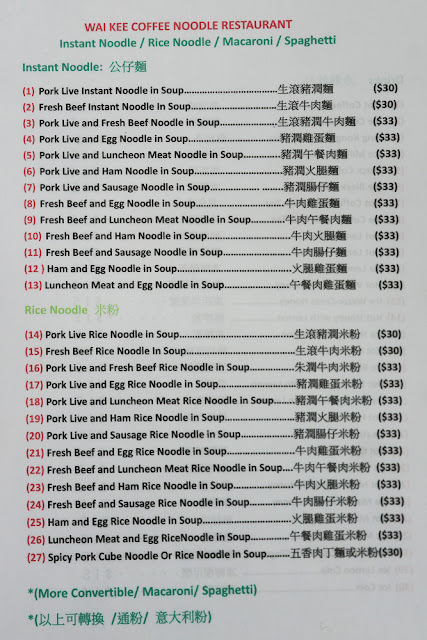 The same great soup with added mystery meat. 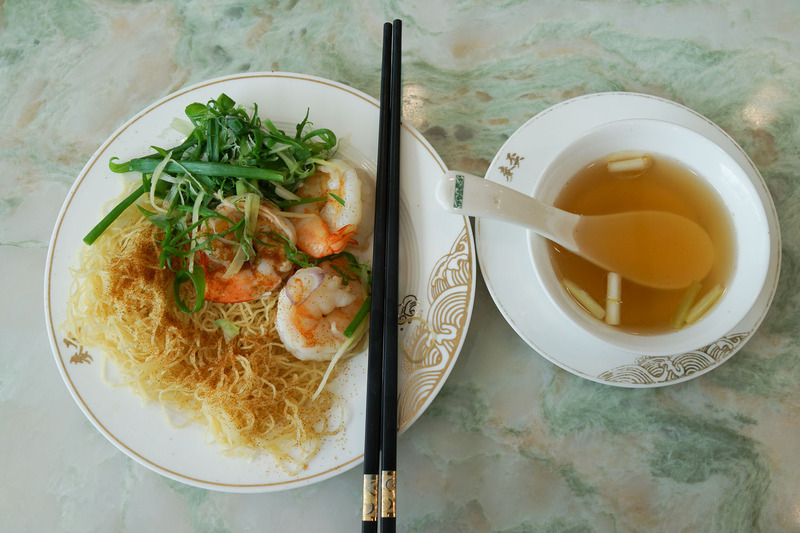 The rice noodles are ok but the instant noodles are the clear winner we reckon. 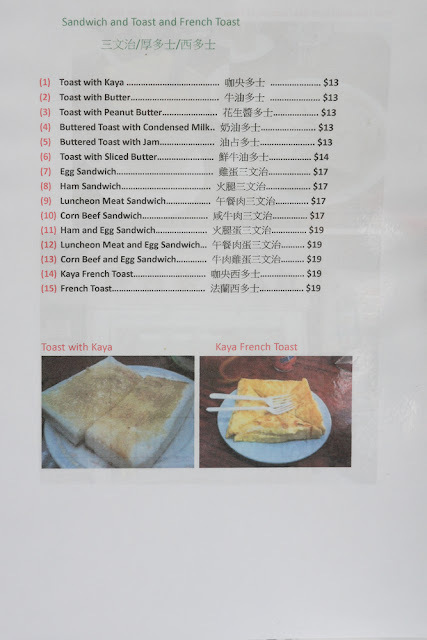 Toast with kaya. 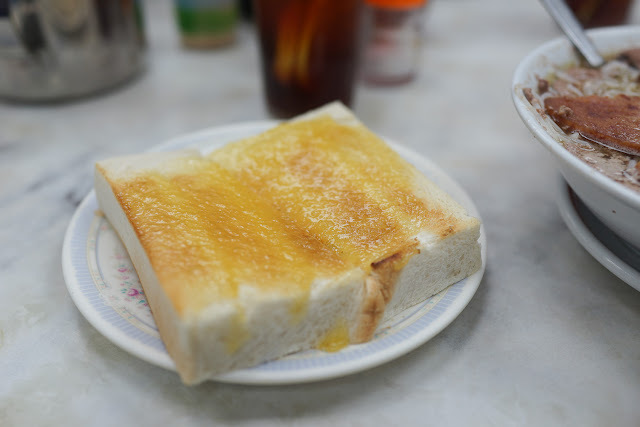 We love the slabs of crust-less soft white bread, made better with some sugary kaya goo on top. Ice tea is a must..
Later in the day we thought we would try somewhere fancy, a dainty ladies-who-lunch joint - it was a pretty average noodle soup for $20. 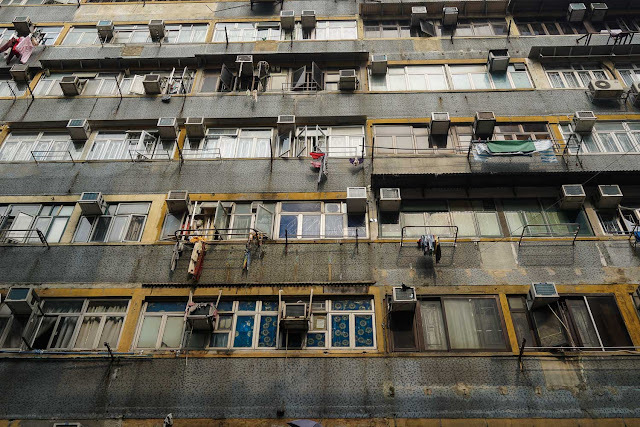 Give us shabby any day. The Woo Sun Temporary Cooked Food Centre is still going strong, this is the first place we ever ate in Hong Kong and we drop in for some beers and stir fry every time we are in Hongkers. It may not be the best but it's pretty dang good and we love the beery circus tent atmosphere. 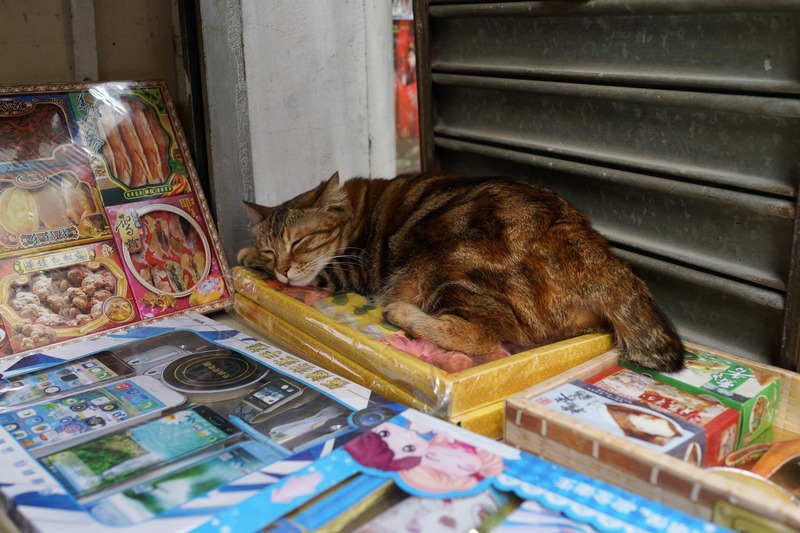 Hong Kong shop cats are the most diligent lying downers of all shop cats - check out these guys. 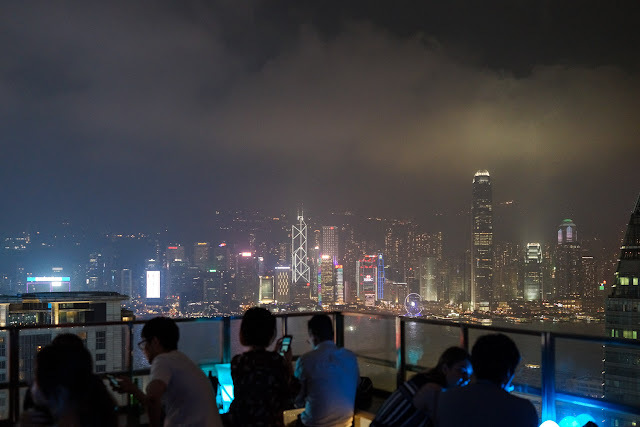 Our new hobby in Hong Kong is checking out rooftop bars, starting with Eyebar. The bevvies are are pricey but worth it for the view Majitos cure vertigo. I missed that you'd been back to Hong Kong. 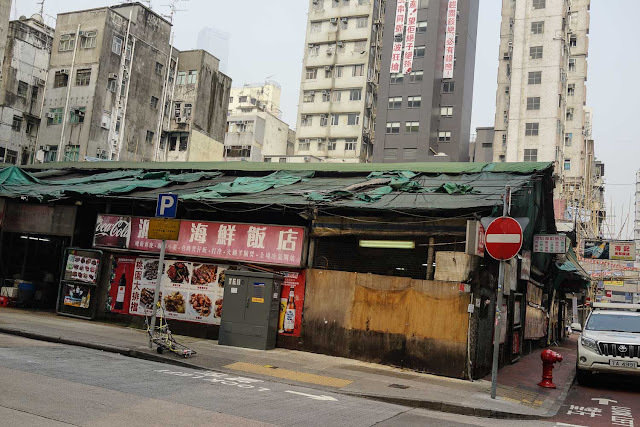 And Sham Shui Po - our very first 'real' Hong Kong experience 9 years ago (and with only 3 kids). 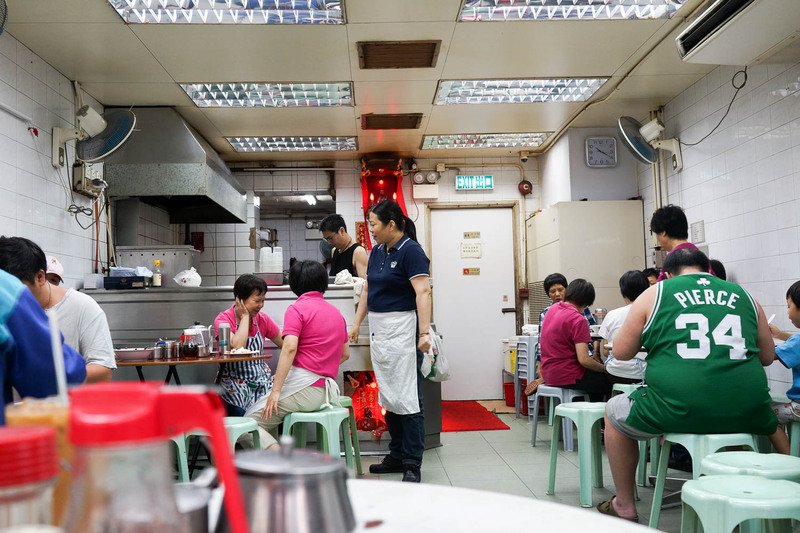 Your write up on Woosung Street got us into that place on our 2nd or 3rd trip and it has been a mainstay every since. Gotta love ghetto eating. 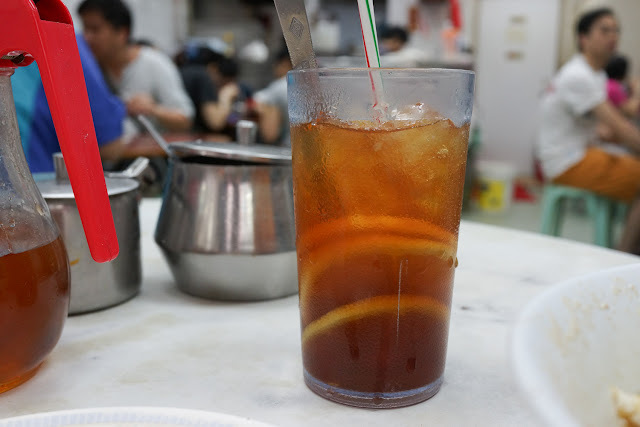 My oldest 3 kids (2 teens and a tween) love ice tea from the Cha Chaan Tengs (and are still partial to VLT Ceylon from 7-11). It epitomises HK drinking for us.